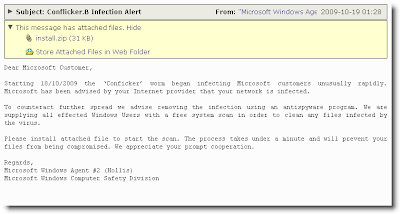 Starting 18/10/2009 the ‘Conficker’ worm began infecting Microsoft customers unusually rapidly. Microsoft has been advised by your Internet provider that your network is infected. To counteract further spread we advise removing the infection using an antispyware program. We are supplying all effected Windows Users with a free system scan in order to clean any files infected by the virus. Please install attached file to start the scan. The process takes under a minute and will prevent your files from being compromised. We appreciate your prompt cooperation.